When it comes to space, Media Vision addressed the issue by incorporating room-combining capabilities via fiber optics. Ours is indeed a multicultural society, one that thrives because of its diversity. But we can only reap the benefits that diversity offers if we can communicate with one another, even when we may not all speak the same language. The need for language interpretation across all facets of business and government is great, creating opportunities for AV integrators to provide the technology that facilitates it. 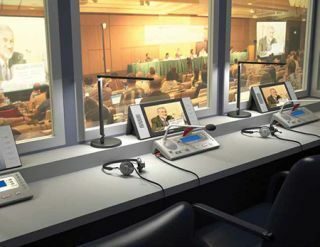 The biggest benefit that language interpretation systems have to offer is that they’re designed to support simultaneous translation: for example, a speaker presents in English and, at the same time, a Spanish-speaking interpreter translates and transmits what’s being said to the Spanish-speakers in the audience, who are equipped with receivers. This is much more efficient (and a lot less cumbersome) than consecutive interpretation, a ping-pong approach that requires the speaker to deliver his or her message in chunks, pausing to allow the interpreter to translate what’s been said before continuing on with his or her presentation. Language interpretation systems also utilize the same technology and frequencies as assistive listening: in 2013, in response to a petition put forth by Eden Prairie, MN-based assistive listening products manufacturer Williams Sound, the FCC modified its rules to allow simultaneous translation devices to operate in the 72 MHz to 76 MHz band. Listen Technologies recently launched iDSP RF and IR receivers, which can be programmed to clearly identify the language being interpreted. The intensity of simultaneous translation requires interpretation systems to be extremely easy to use. “It’s like doing an extreme sport,” said Marcela Lopez, a Spanish-English interpreter and president of Spanish Solutions Language Services, an interpretation and translation firm based in Miami, FL. “You’re listening and coming out with the translation at the same time—you’re monitoring yourself and the speaker.” Interpreters generally trade off every 20 or 30 minutes, sometimes less if presenters speak particularly fast, or if the presentation is peppered with highly technical information like acronyms, she explained. Traditionally, language interpretation systems are based on RF, IR, and digital RF transmission. With the prevalence of BYOD, however, several manufacturers are developing systems that stream directly to smartphones, letting meeting participants use their personal mobile devices as receivers. (In other words: there’s an app for that.) As of press time, Sennheiser’s Mobile-Connect supported up to 25 users per system, with plans to expand to 50, and then 100, throughout the course of this year. Williams Sound released its mobile solution, Hearing Hotspot, at InfoComm 2014. With the prevalence of BYOD, several manufacturers are developing systems that stream directly to smartphones, letting meeting participants use their personal mobile devices as receivers. (Left) The Sennheiser MobileConnect supports up to 25 users per system, with plans to expand to 50, and then 100, throughout the course of this year. (Right) The Sennheiser tourguide 2020-D system relies on a digital RF transmission to connect the guide’s mic to his or her tour group, wearing the HDE 2020-D II headset. While healthcare, law enforcement, and courtroom applications—where lives literally hang in the balance—are the most obvious use cases, the need for language interpretation systems touches pretty much every market one can think of. National and multinational organizations must communicate with employees, suppliers, and clients from all over the world, and higher education institutions courting foreign students may incorporate language interpretation into events, such as campus tours. At the K-12 level, schools apply it to parent-teacher meetings in an effort to empower non English-speaking parents to be involved in their children’s education, and houses of worship use it to address increasingly diverse congregations.